This paper is a look into some the repositories solutions available for Moodle 2, their features and the type of integration functionality. The release of Moodle 2 brought with it a challenge which most Moodle administrators and teachers had not encountered before, that is, the integration of a content repository with the course management system. The white paper has 3 parts. typo on p6, Content section. many thanks for the paper. Thanks for the correction and the feedback. 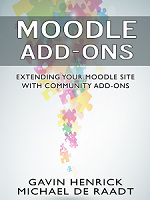 There is a Moodle package for Macs. great work on the site. I was reading one of your eportfolio articles (the exabis one) and the word repositories caught my eye! On Friday, I was struggling with whether to enable a dozrn of so users (teacher level) with WebDav or FTP access. Both are set up and permissioned. Is it possible to link to file in the Moodle WebDav (ie to know the URL of a file someone uploads) so that one can include this link/URL in another place, to link to the uploaded-into-WebDav file?